What would you make with Nancy Halvorsen's Home Grown fabrics? We've asked six designers that question, and we'll be showing you their answers. 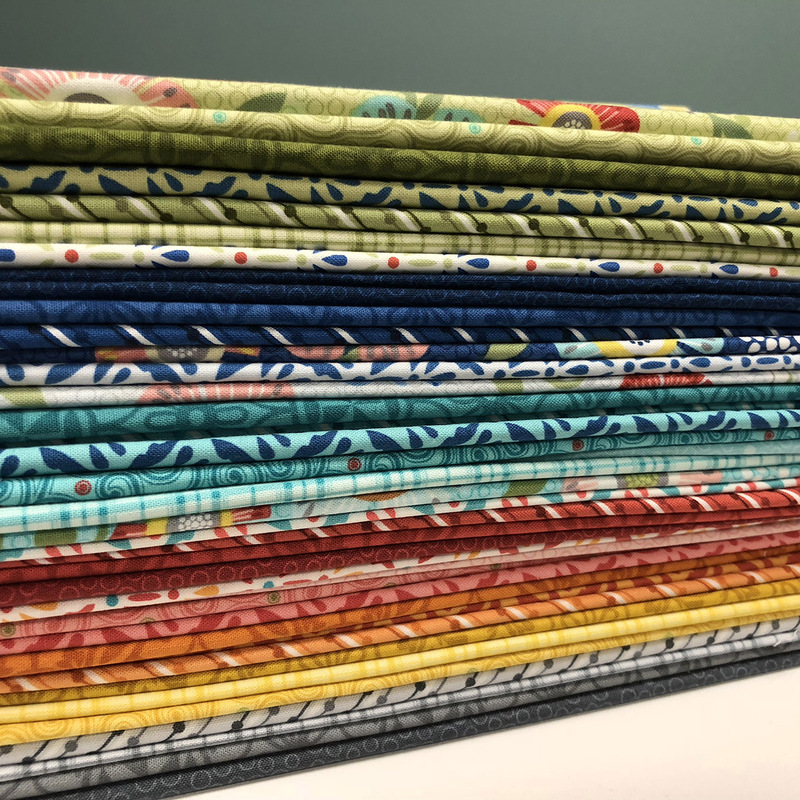 Follow along on our blog hop Tuesday through Thursday, including chances to win some fabric for yourself, and then make sure to come back Friday for a virtual trunk show of Nancy's projects! 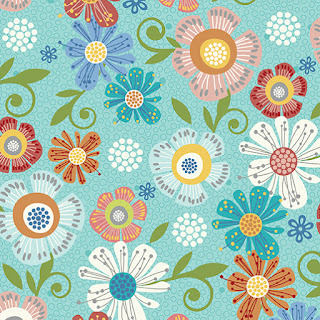 "I loved the fresh, whimsical flowers in Nancy's fabrics, they make me think of spring! I loved how the cute prints lend themselves so well to making accessories, which are my favorite things to make. 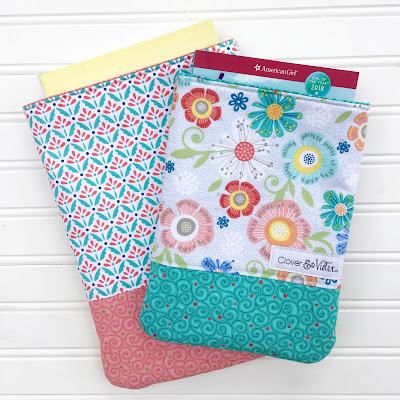 For this blog hop I made fat quarter friendly book sleeves, which will bring some spring cheer wherever I go." Head over to the Clover and Violet blog to see more about Jennie's book sleeves. 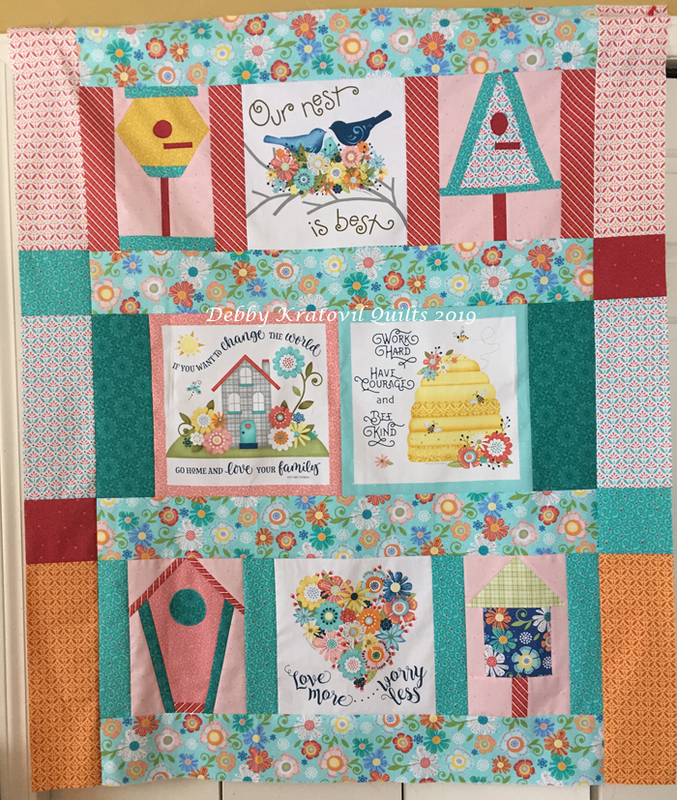 and enter to win a FQ bundle of Home Grown prints. 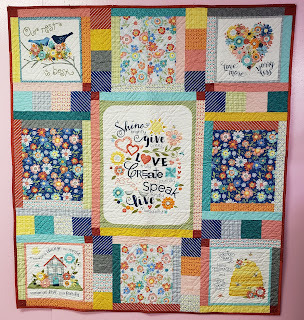 "I enjoyed working with this line to make a baby quilt because the fabrics are just so happy! I love the different blender prints -- the plaid and the stripe are my favorites -- and the large floral prints are gorgeous!" 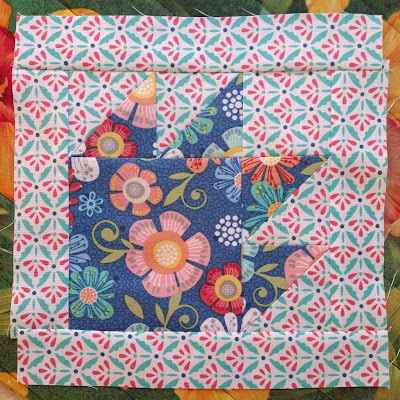 Head over to Alison's blog to see the whole baby quilt made from these Bear Paw blocks and enter to win a FQ bundle of Home Grown prints. Click here to see the entire Home Grown collection. Click here to visit Nancy's Art to Heart website. Follow along with our week of Home Grown fun! 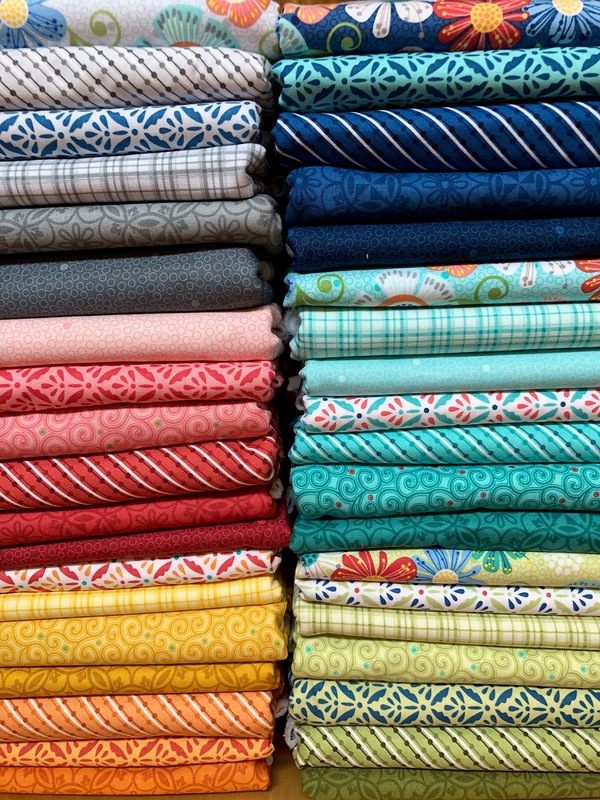 We'll be sharing inspiring projects featuring the fabric all week long. 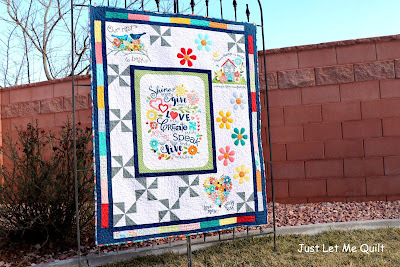 "I feel so lucky to have been able to join this blog hop and sew with Home Grown! It has a panel with the cutest designs and sayings on them, too. I used four of the sections of the panel in my quilt, 20 fat quarters, and two different fabrics for borders and binding." 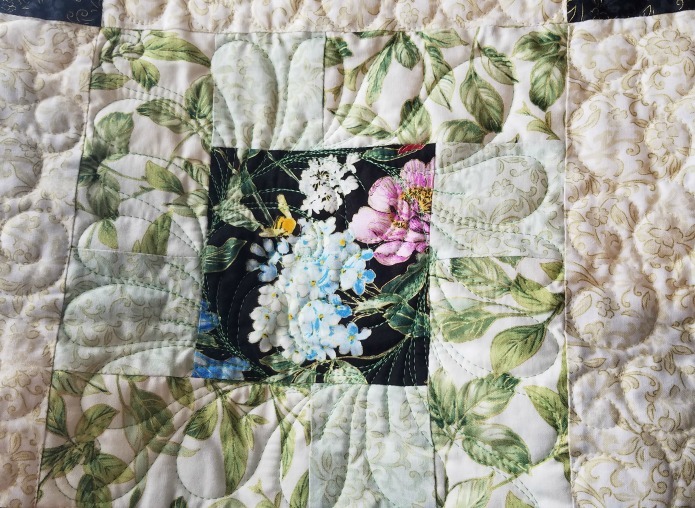 Head over to Carol's blog to see more of her quilt and enter to win a FQ bundle of Home Grown prints. "I LOVE panels - in fact, I'm a self-proclaimed panel hoarder! Panels are so versatile. 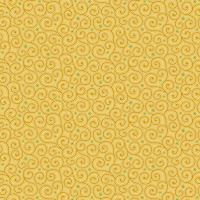 You can create so many fun and unique projects from them. The colors in this line bring joy, freshness and brightness after a long winter with lots of gray. 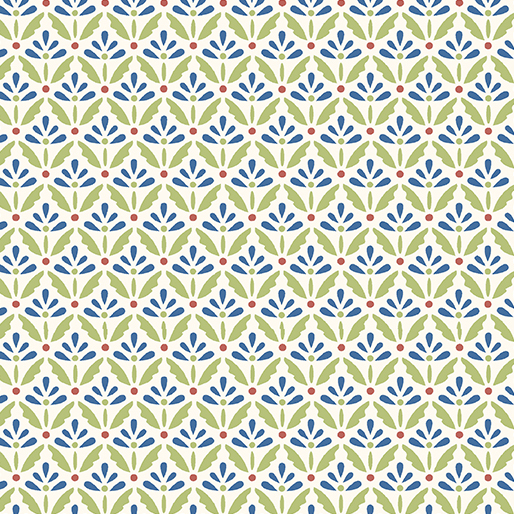 The designs are scaled so they work beautifully as either a blender or a focal fabric." Head over to Nancy's blog to find her quilt (and a pillow!) 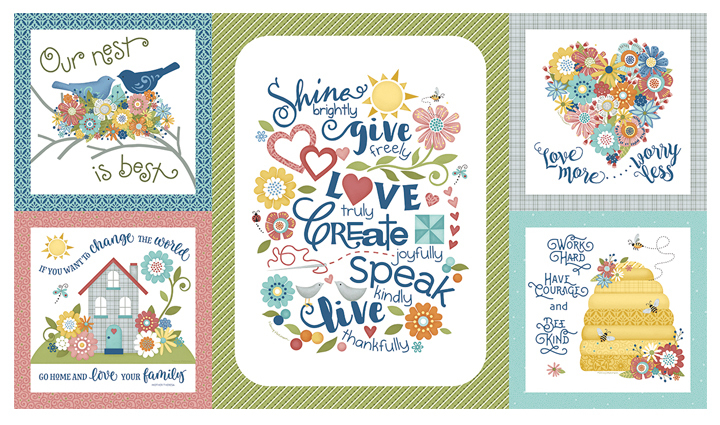 and enter to win a FQ bundle of Home Grown prints. 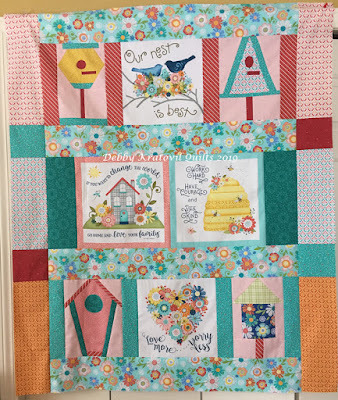 Head over to Debby's blog to see the birdhouses up close and enter to win a FQ bundle of Home Grown prints. "When I first saw the colors and prints in this collection, I just knew that I had to use them to make something fun. The colors are so happy, and the prints are versatile enough to use just about anywhere. It's a perfect bundle of cheer to help fight the winter doldrums! 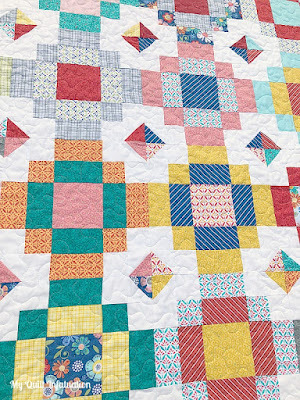 This is the Hopscotch quilt, and it's a twist on a classic block. 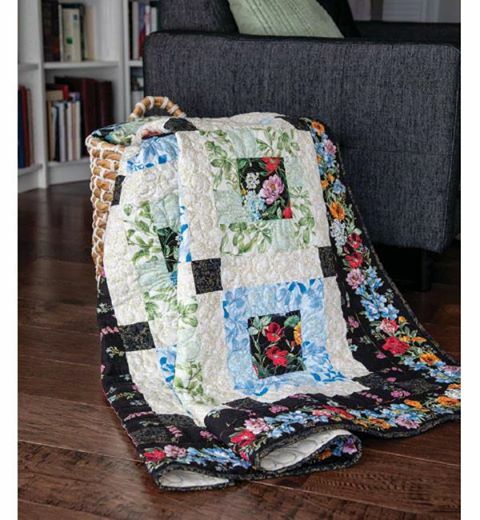 This one is perfect if you need a quick quilt. Head over to my blog for a full tutorial, as well as the opportunity to win this pretty bundle for yourself!" Head over to Kelly's blog to find her tutorial and enter to win a FQ bundle of Home Grown prints. Click here to visit Nancy's website. 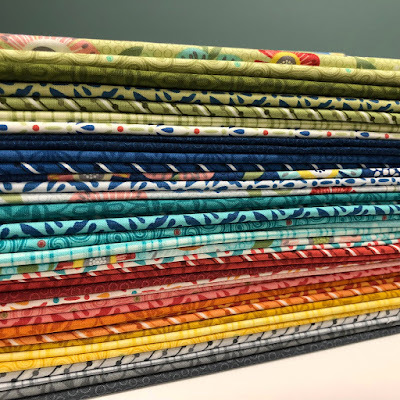 Nancy Halvorsen's newest collection, Home Grown, is filled with the everything you love about her fabrics. It's all about family--celebrating the love that fills a home in classic Nancy style. The fabric line includes a sweet panel with positive messages, pretty florals, and unique tonals--stripes, swirls, dots, plaids and more. We asked Nancy to talk to us about Home Grown below. What inspired the Home Grown collection? To me, family is very important. I’ve never done anything that was home and family themed before. While I was thinking about home, I thought of homegrown flowers, and the idea went from there. Tell us about the panel. I always like to include a cheery and uplifting message in my panels. The panel features messages that you want your family to know and to internalize. For each block, I came up with the message and then figured out how to illustrate it in a fun way. The prints in the frames around each block are also standalone prints in the collection. The prints also show up on different items in the panel—like the bee skep and the house. Panel measures 42" x 24"
How do you select your palette? 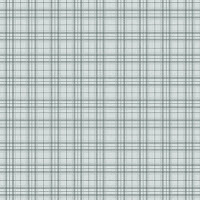 When I start a fabric line, in the back of my mind I have an idea of what projects I’m going to be making with it. That dictates what the palette is going to be. 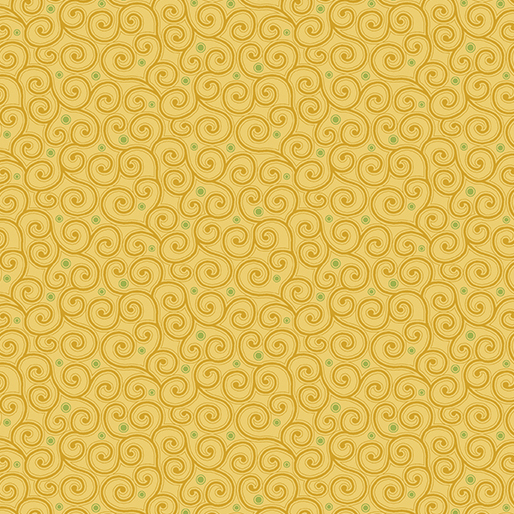 Because this line has a floral theme, I wanted to make sure I pulled flower colors into the line. How do you come up with the small print coordinates for the collection? Having been a quilter and designer for so long, I know that I need some small patterns for texture and then some stripes and bigger prints. 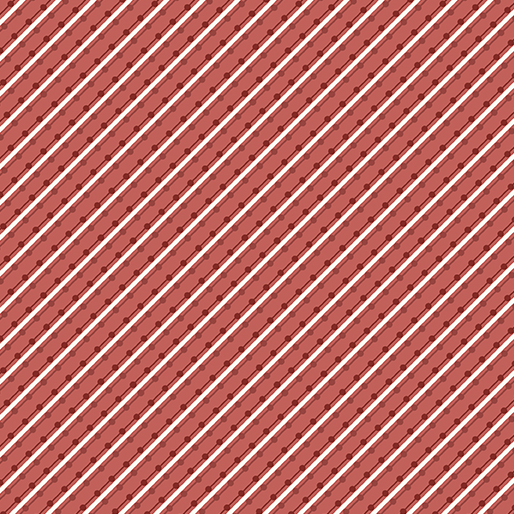 I do this for all my lines—it adds more interest to have different sized prints. 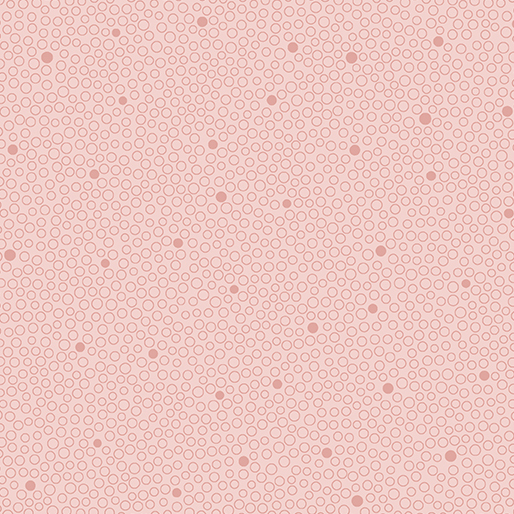 To me, texture is as important as color to add interest. Need a little floral pop? Spring is around the corner...we promise! Stephanie Sheridan's Wildflower Meadow quilt is featured in the newest issue of McCall's Quilting. 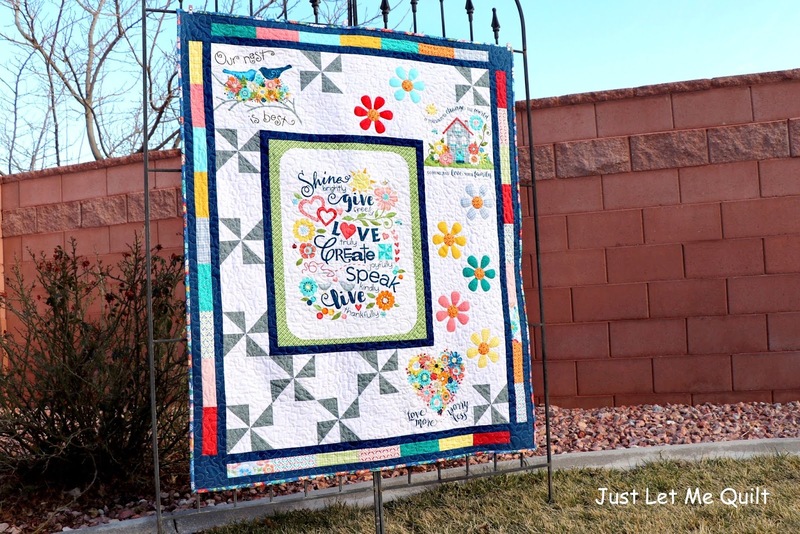 This quilt is packed with blooms from Kanvas' Field of Dreams. featured in the March/April issue of McCall's Quilting. 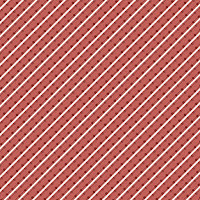 What attracted you to the fabric line? Do you have a favorite print? I loved the all of the flowers with the touch of metallic - sometimes it is fun to just design a pretty quilt with pretty fabrics. 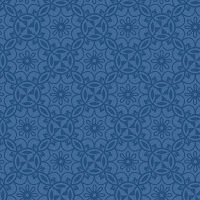 My favorite fabric is the focal print - such great detail and colors! 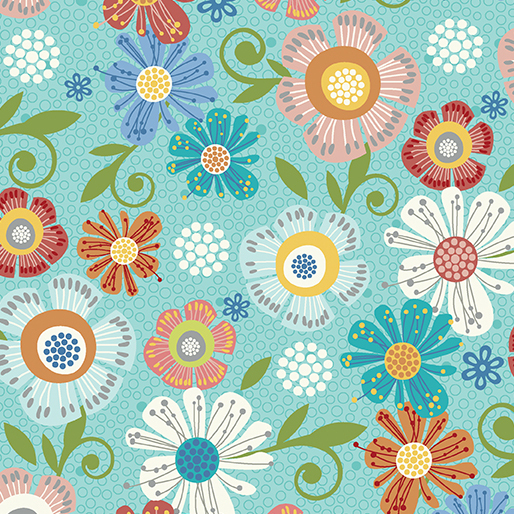 Did you fussy cut flowers for the block centers? I did! I knew that I wanted both of the hummingbirds (they remind me of my great grandmother) and one of each of the types of flowers. Once I cut out all of the squares I played around with placement on my design wall until I got them the way I wanted them - then I took a picture with my cell phone so that I could keep them in their place as I was making the blocks and assembling the quilt. 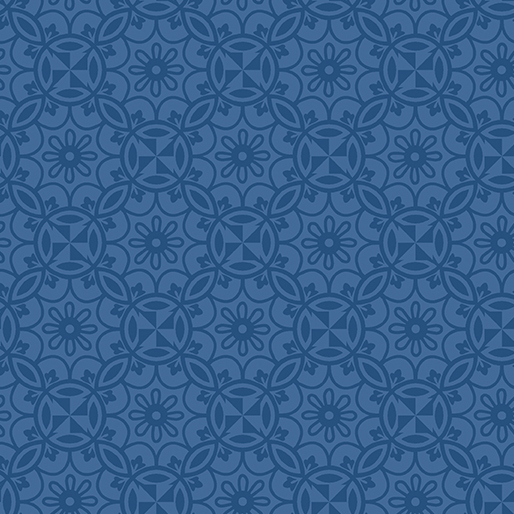 How did you choose the coordinates to use around the floral squares? They pretty much chose themselves ... the two shades of blue and green just seemed perfect for framing the focal squares. Can you talk about your border choices? 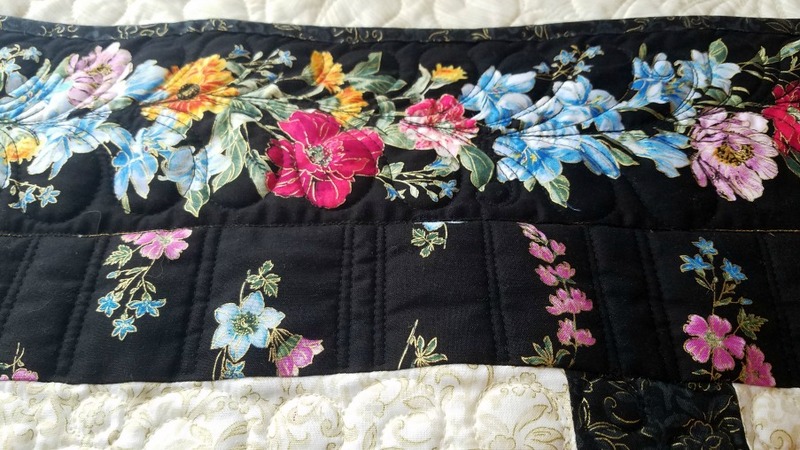 I chose the scattered flowers on black and kept the inner border the same width as the sashing to serve as a bridge between the center of the quilt and the floral mitered outer border - it just helped the whole quilt flow together. How did the design come about? 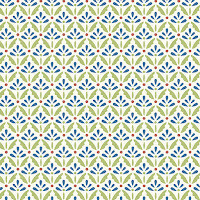 I loved this fabric from the first time I saw it and knew that I wanted to create something pretty with it. This quilt uses two construction techniques that are really useful in any quilter's repertoire - partial seams and mitered corners. 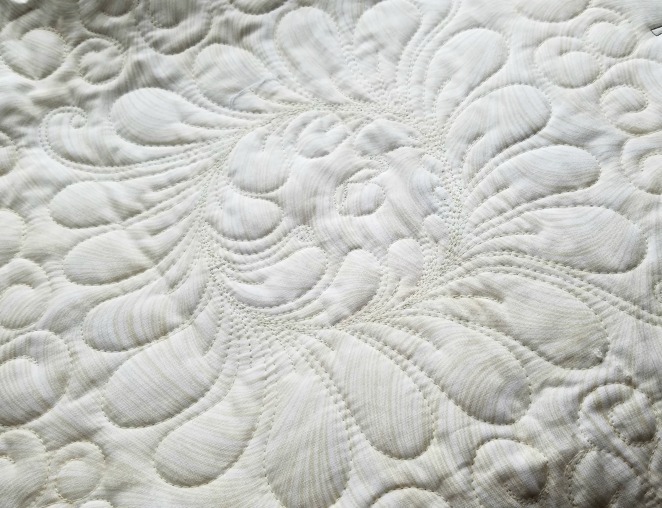 I hope that quilters will enjoy challenging themselves to make this quilt. 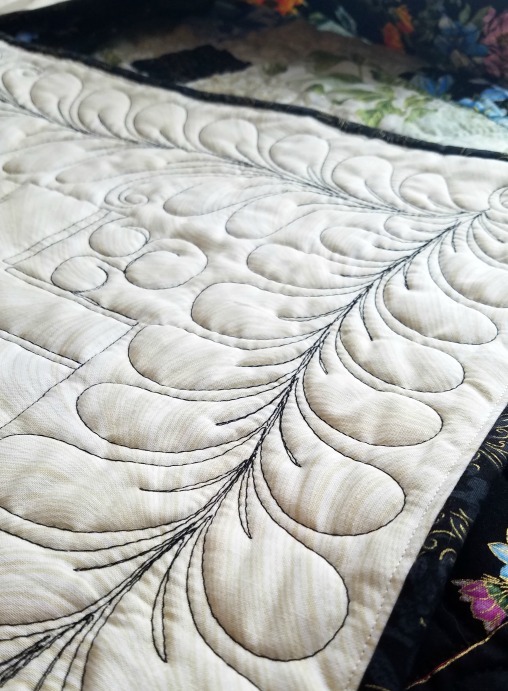 Can you talk about the quilting? 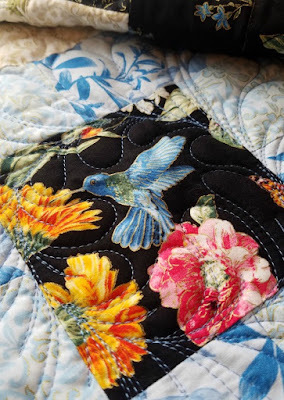 My mom continued the "pretty" theme with the quilting - lots of swirls and feathers, with a beautiful feathered wreath over each of the blocks. What do you see this being used for? This quilt is a great throw size. 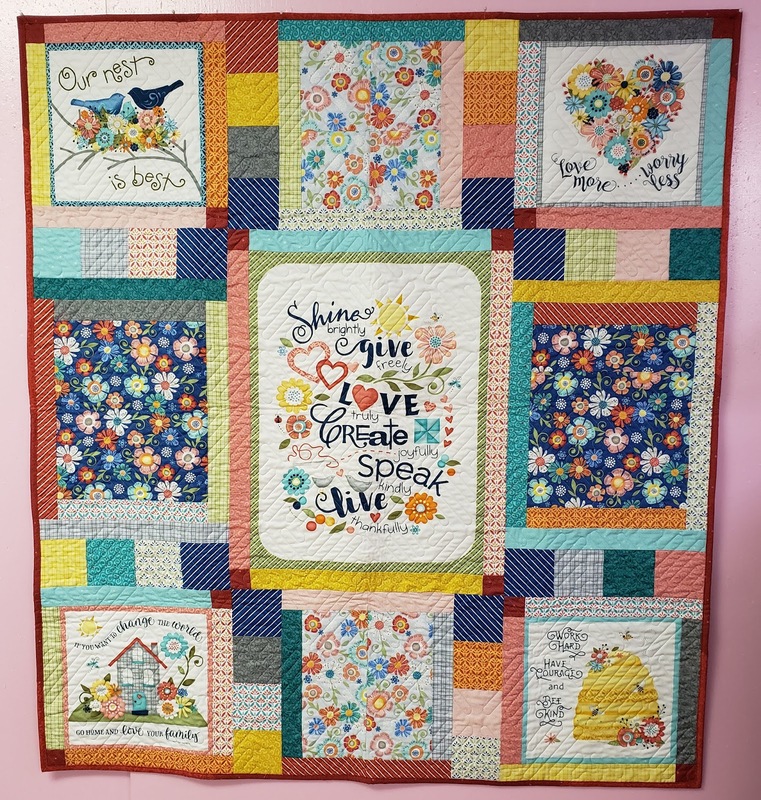 It would be perfect for those cool summer evenings when you are out on the porch swing, or could make a great wall quilt. Heck, I want to use it on the couch tonight to remind me that winter won't last forever here in Pennsylvania! Click here to see the Field of Dreams collection. 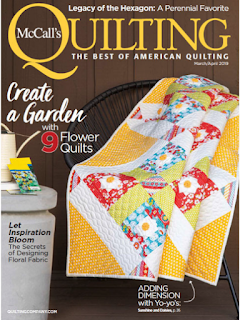 Click here to find this issue McCall's Quilting magazine.